An overwhelming majority of Americans — 76 percent — are worried that the United States will become engaged in a major war in the next four years, according to a new NBC News|SurveyMonkey National Security Poll out Tuesday. The number has jumped 10 points since February, when 66 percent of Americans said they were worried about military conflict. Although Americans are concerned about a number of national security threats, a strong plurality (41 percent) believe that North Korea currently poses the greatest immediate danger to the United States, emerging as a more urgent concern than ISIS (28 percent) or Russia (18 percent), according to the poll, which was conducted online from July 10 through July 14. North Korea has emerged as a flashpoint for the current administration, as tensions have rapidly escalated since President Donald Trump took office. 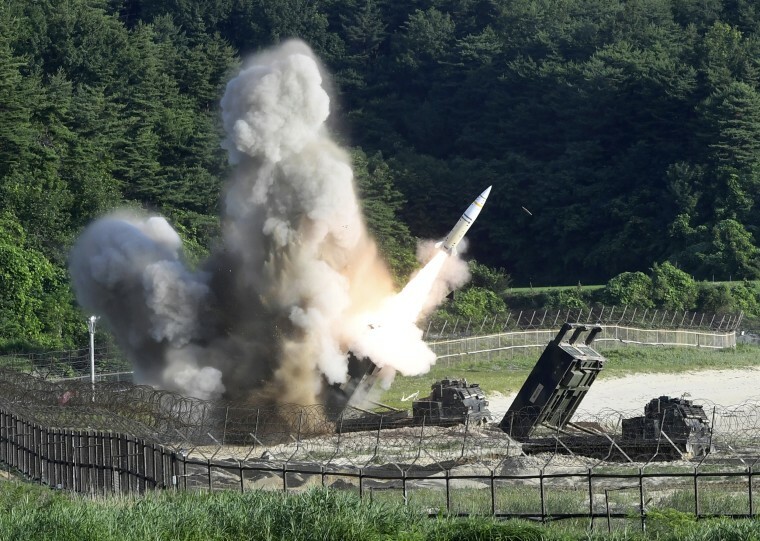 In the past few months, North Korea has conducted multiple missile tests — with the most recent provocation involving a ballistic missile with the range to reach Alaska. Americans also are feeling much more concerned about North Korea compared to just a year ago. Three in 5 Americans (59 percent) say they currently feel less safe from the North Korea threat compared to how they felt the previous year. As the administration continues to weigh its options, a majority of Americans (59 percent) believe the United States should mostly use diplomacy over military force. In an April interview, Trump said the United States would "love to solve things diplomatically, but it's very difficult." "There is a chance we could end up having a major, major conflict with North Korea," Trump said. The administration has said all options remain on the table. Opinions about how the United States should deal with North Korea differ sharply by party, the poll found. Democrats and Democratic-leaners are the most likely group to favor a diplomatic route (76 percent), and a strong majority of independents would also prefer diplomacy over military action (65 percent). Republicans and Republican-leaners are slightly more split, but a majority say the United States should mostly use military action (56 percent). Of those who say North Korea poses the greatest immediate threat, 80 percent are very or somewhat worried that the United States will become engaged in a major war within the next four years. Meanwhile, when it comes to the country's counter-terrorism efforts, only a quarter of Americans say there are currently adequate limits in place on the telephone and Internet data collected by the government — an important number as Congress looks to renew controversial aspects of the Foreign Intelligence Surveillance Act (FISA) this December. Nearly a third of Americans (31 percent) say there are not adequate limits on what the government can collect and a plurality (41 percent) said they do not know enough about what is collected to say. These numbers highlight an active debate emerging between the intelligence community and policymakers: how to balance Americans’ privacy concerns while giving counter-terrorism experts the tools they need to effectively thwart attacks. The NBC News|SurveyMonkey poll was conducted online from July 10 through July 14, 2017, among a national sample of 5,347 adults. Respondents for this non-probability survey were selected from the nearly 3 million people who take surveys on the SurveyMonkey platform each day. Results have an error estimate of plus or minus 2.1 percentage points. For full results and methodology, click here. Andrew Arenge is a researcher with NBC News' Education Nation team. He started in this role in August of 2013. Arenge is responsible for managing Education Nation's social media feeds and writes content for NBC News' new website for parents, the Parent Toolkit.